This is fine Black alpaca top. Is gorgeous cool fiber. An absolute joy to spin. Black Alpaca fiber is silky, lustrous and over dyes beautifully. Huacaya alpaca imported directly from Peru. FS (Fine Spinning) Grade; 25.5 to 26.5 microns. This is fine Brown alpaca top. Gorgeous cool fiber. An absolute joy to spin. Brown Alpaca fiber is silky, lustrous and over dyes beautifully. Huacaya alpaca imported directly from Peru. FS (Fine Spinning) Grade; 25.5 to 26.5 microns. This is fine almost-white alpaca top. Gorgeous cool fiber. An absolute joy to spin. Cream Alpaca fiber is silky, lustrous and over dyes beautifully. Huacaya alpaca imported directly from Peru. FS (Fine Spinning) Grade; 25.5 to 26.5 microns. This is fine Silver alpaca top. Gorgeous cool fiber. An absolute joy to spin. Tan Alpaca fiber is silky, lustrous and over dyes beautifully. Huacaya alpaca imported directly from Peru. FS (Fine Spinning) Grade; 25.5 to 26.5 microns. 70% fine Alpaca blended with 30% Tussah Silk. 70% fine Alpaca blended with 30% Tussah Silk. 70% fine Alpaca blended with 30% Tussah Silk. Combed fine top, length of staple is 3.5". A wonderful top that is great for felting too. 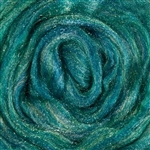 BFL Blue Faced Leicester dark top . BFL Superwash (Blue Faced Leicester) white combed top . This is a grab bag of ends. When we weigh out wools we're often left with ends under and ounce or some such and we usually dye in 2 or 4 ounce quantities. This means you luck out and get a bunch of ends for a steal. None of them are labeled with the fiber type but it's a lot of fun to play with. 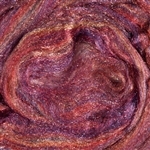 Have fun spinning and practice your techniques or use them to practice and play at dyeing or felting. (some are superwash and will not felt, test samples) You get all ranges of wool from Wensleydale/Romney to blends that have silk in them. Most are white but each bag we put together has some colored wools in them. This fiber is shiny and fuzzy at the same time. It's a great blend of Cashmere and Angora. 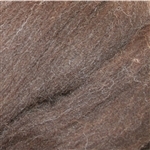 Cashmere - Light Brown - combed top Rare breed and hard to find - combed top ecru Cheviot - ordering by the ounce. Amazing Cotton Roving Sliver from Eco Butterfly. It's certified 100% Organic and comes in the most amazing colors. Fair Trade. Choose your color in 2 ounce packs. Llama - super dehaired - combed top New Manx Loaghtan wool top has a micron count of 28 and staple length is about 3 inches.